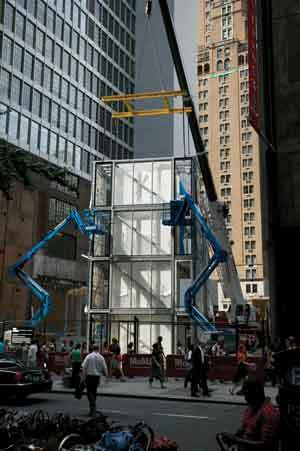 Search results for "Far West Side"
Kieran timberlake's Cellophane House was assembled on-site at MoMA. It’s a rare sight to see single-family houses in Midtown Manhattan and rarer still to see something as small as the silvery micro compact house (an approximately 2.6-meter cube, fitted out like a boat with bathroom, kitchen, sunken dinette, and bunks) looking like a studio apartment left out in the rain. The double-takes of passers-by on 53rd and 54th streets are amusement enough. That strangeness is historic, a point the excellent and thorough exhibition inside makes abundantly clear. There’s a sixth house up in the gallery, a return of the suppressed for MoMA: a Lustron Westchester Two Bedroom (1948–50)—an all-steel, 32 feet square house with powder-coated exterior panels in pastel colors and factory-made cabinets, closets, and vanities designed to be put together in eight days. It was the hugely popular Lustron demonstration model in Midtown that was the impetus for MoMA’s first house in the garden, Marcel Breuer’s 1949 butterfly-roof structure, meant as an elite corrective to the multiplying postwar Cape Cod cottages that even the technically accomplished Lustron aped. Today, the Lustron is welcome inside the museum, one of a number of nice high-low admixtures, though the architects outside might still shake their heads over its traditional plan. The exhibit places Quonset huts next to Frank Lloyd Wright Usonians, and shows Ford Motor Company’s filmed dream of happy workers constructing a house as quickly as a car alongside Buster Keaton’s spoof of the same, One Week. Then as now, the gable beat the butterfly in the war of the rooflines, and the exhibit acknowledges that fact both in the text and on the lot. Next to the four flat tops sits Lawrence Sass’ House for New Orleans, a shotgun house made in the most contemporary way. The house, a prototype intended for Katrina refugees, is made of laser-cut plywood panels with cut-outs and tabs that allow it to fit together without nails or hinges, only a rubber mallet. As a contextual grace note, the porch is decorated with two-dimensional Victorian-style gingerbread (one of a number of styles that could be produced). All this ornament makes the modernist nervous—it is literally a “decorated shed”—but we are clearly in an age where computers make old patterns new again and mass customization is sexier than mass production. The porch ends up looking fussy, but the unintentional gridded pattern inside, created by all those I- and X- and T-shaped slots, is beautiful. However alien to the MoMA enterprise, it is important to have an example of (perhaps) more popular taste, as well as one of refugee housing. Sass says this prototype, if mass produced, would cost $40,000. All five houses are meant to be objects of study, not products, but in fact, they are all for sale: The architects, from as far away as Austria and as near as Philadelphia, retain rights to the buildings and surely don’t want to have to ship them back home. One can’t help but try to place them, matchmaking Kieran Timberlake Architects’ Cellophane House—four stories, recyclable, transparent, made of snap-tight aluminium frames filled with panels of photovoltaics, polycarbonate, and Corian—with a Brooklyn brownstone neighborhood in need of new blood. Or Oskar Leo Kaufmann and Albert Rüf’s System 3—a long, blonde wood box, shipped as core and flat-packed walls, that fits inside a container and can be stacked into multiple stories—as a slender thorn in the side of a Connecticut suburb. The micro compact house, installed in two hours, seems like the ultimate luxury item—a room of your own that the super-rich could literally drop wherever they go. LAWRENCE SASS' HOUSE FOR NEW ORLEANS (top) was one of the few projects to shed the veneer of the expensive modernist dream. Richard and Su Rogers' Zip Up Enclosures No. 1 and 2 (1968-71, above) was designed so that users could continually add to it via standardized components. That ability to drop a house into whatever wilderness or city you desire has long been part of the prefab dream, from Archigram’s Plug-In City (1962–64) to the realized but never reconfigured Nagakin Capsule Tower (1968–72) in Tokyo. Now that the houses are complete, much of that drama and difference dissipates. The action happened in the weeks and days before the opening, and can still be seen on the exhibition website. The indoor exhibition also integrates film much more successfully than most contemporary architecture shows: cranes with pods, trucks with stacks, and the magic of making play over and over. For anyone who has suffered through home construction, it is like the beautiful amnesia that sets in after completion, a mental time-lapse film of the process. At Home Delivery, there is much to learn about flat-packing, laser cutting, tool-free assembly, and integral photovoltaics. But what will this change about architecture? The exhibition makes clear that the yearning for prefabrication, which caused every major modernist architect to design at least a prototype, was born of a combination of utopian and taste-making fervor. At different points in the 20th century, we needed housing, quick and cheap. Buckminster Fuller’s Wichita House (1944–46) was intended to provide jobs and homes simultaneously for returning servicemen, turning Midwestern factories from bombers to home production. The Eames House (1945–49) was intended as an aesthetic corrective to Levittowns, and showed how much space one could enclose for the least amount of money using existing parts from industrial manufacturers. These were modernist prophets, but they also had a sense of economy. They turned to prefab out of exigency, with the desire to streamline housing as the production of cars and refrigerators had been. That sense of exigency seems absent from 54th Street. These houses show economies of time, material, and energy, but they still look (except for the House for New Orleans) like expensive modernist dreams. It could still be the 1940s, with architects trying to persuade manufacturers there’s a market for modernism, but the market really existing only at the high end and for the very Dwell audience the exhibition claims it wants to move beyond. Good taste as mandated by MoMA still hasn’t become mass taste, and so these houses may be doomed to the same failure as prototypes by Le Corbusier, Gropius, Rudolph, and Rogers. 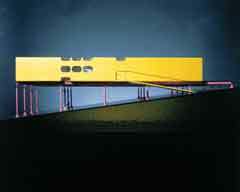 The “cultural divide” to which Bergdoll directly refers in the show’s catalog, between those “exploring new relations between architecture and production and the steady, almost reflexive, success of manufactured housing” is not bridged here. Maybe a manufacturer will take up the Cellophane House or System 3. But is that going to solve any housing problems? The promise of prefab still seems unfulfilled. With the expiry of 421a tax abatements on June 30, developers in New York City entered their most uncertain era of pricing decisions since the city created the program a generation ago. The Cooperative and Condominium Abatement program, which used a system of graduated tax abatements to spur development at a time when there was little, lasted decades longer than the crisis that gave rise to it, becoming a part of local developers’ financing logic. Now, anyone who uses it will also have to set aside 20 percent of new units for lower incomes. Some developers say they don’t know how to make the math work. For more than a generation, 421a was a sine qua non in local development. The 421a program, as the city’s website defines it, came along in 1971 “to promote multi-family residential construction by providing a declining exemption on the new value that is created by the improvement.” In other words, a developer using the program can use the value of raw land to calculate taxes for somewhere between ten and 25 years. (The name references Section 421a of the relevant city law.) An exclusion zone between 96th to 14th streets and down through much of the West Village required developers to include affordable housing to qualify for abatements. Beyond changing developers’ risk basis for construction in former industrial neighborhoods, 421a created a sort of currency. Developers who built affordable housing collected five certificates per low-income unit, which they could sell to developers working in the pricier districts where tax abatements were a particularly strong inducement for buyers. It was good policy in the Koch years, but as more and more of Manhattan gentrifed, projects in Soho and Tribeca took advantage of 421a. A law intended to preserve working-class housing had become an unintended boon to luxury developers. Properties offering the abatement include 555 West 23rd Street in tony West Chelsea, and Soho Mews, a Charles Gwathmey–designed townhouse and condo with a private courtyard between Wooster Street and West Broadway. For even the most casual observer of the then-booming real estate market, it seemed out of whack. Romy Goldman, a principal in Manhattan’s Gold Development, takes a less blithe attitude. Without banking on tax abatements, she told AN, investors in projects like her firm’s cannot create meaningful forecasts for prices that will allow them to recoup their costs. Her firm developed the Deborah Berke–designed condo building at 48 Bond Street and is now marketing Hamilton Lofts, a 12-unit project on Edgecombe Avenue. Goldman calls herself a believer in mixed-income housing, but she said tacking a 20 percent requirement onto new condos in an uncertain mortgage market means forcing some developers to withdraw. Indeed, developers who can neither offer buyers an inducement to pay high interest rates on mortgages nor sell only to very wealthy buyers may simply take their money off the table. If development slows down, the seemingly unthinkable would follow: The cost basis for local real estate may decline. “In six months, you’re going to see a major shift in land prices,” Goldman said. Theoretically, changes in the law should flow into land prices in a more orderly fashion, since the council debated reforms extensively before passing them earlier this year. Instead, in what Goldman calls a “perfect storm,” many developers rushed to pour foundations while they could still enroll in traditional 421a programs. That meant paying inflated construction and labor costs, which helped keep New York’s asking prices high even as the foreclosure crisis and Wall Street turmoil singed the economy. Champions of 421a reform make no apologies. “My sense, from the developers that I have talked to, is that they will blame 421a changes for what many other factors in the marketplace are doing,” said City Council candidate Brad Lander. As head of the Pratt Center for Community Development, Lander advocated for more mixed-income requirements in new rezonings for residential development. If he and Thies win office and have to steer the new 421a to implementation, Goldman warned, they will find that such requirements are difficult to translate to a developer’s pro forma. Thies says 421a was an anachronism in a city where developers are jockeying for sites in places like Greenpoint that suffer from poor subway access and extensive brownfields. The farsighted move, he argues, is to introduce a new trigger for tax abatement that matches a crisis of energy costs rather than a lack of eager developers. “Smart developers saw incentives for infrastructure improvements and environmentally friendly buildings on the way,” Thies said. By that logic, the end of 421a may mean the beginning of other programs that can make green architects, engineers, and planners valuable. While much of the Moynihan Station project has focused on the use of the Farley Post Office as the new Beaux Arts home for Penn Station—a nod to the original torn down between 1962 and 1964—Chakrabarti said that anyone who has thought of the bigger picture realizes that more than the station needs to be rehabbed: “There are really interesting questions about why the area around Penn Station never grew the way the area around Grand Central did.” But whatever the causes, he believes the area needs office buildings, hotels, and residential space in addition to the new station. He hopes the Amtrak bill that recently passed in Congress will help people see the need for a vastly overhauled transportation hub on the West Side. Although trained as an architect, he said that design comes lower on the list of priorities when brokering a deal as huge and intricate as the Moynihan Station. As head of the Manhattan office of the Department of City Planning from 2002 to 2004, Chakrabarti, 42, advocated for the development of the Hudson Yards, a plan that’s still very much a part of his vision of the future city, with high-density housing close to transportation. But a project like that, he said, can only be accomplished through public-private partnerships: “The private sector built Grand Central terminal and the original Penn Station, right? So it always amazes me when I read some of this stuff [disparaging the involvement of the private sector]. I don’t understand people’s lack of historical understanding about how much of New York City is actually built that way.” There’s no reason why Moynihan Station and the Hudson Yards, he said, should be an exception. Five years ago, if you brought up the name Alf Naman at a developer's lunch, you probably would have received a lot of blank stares and an awkward silence. Who? Now the man is a hot topic, pitched to the press and around town as something of a maverick. The epithet is not unwarranted. A look at the two development projects he's had hands in to date—the Jean Nouvel-designed 100 Eleventh Avenue, which is being developed in partnership with Cape Advisors, and Neil Denari's HL23—reveals a man conscious of design and optimistic about the potential of architecturally forward buildings, dedicated to laboring within and nurturing a specific neighborhood, who has positioned himself to rise with the tide. But mostly he is a man alone, without family business or large corporation behind him, working to put his distinguishing mark on a city so full of them as to make the brightest stars seem commonplace. Of course, Naman didn't spring fully formed from the girders of the High Line. After moving to New York in the late 1980s as a political science student, the Boston native got a job at a real estate company and has never looked back. By the mid-90s, he was buying and flipping residential buildings in Tribeca. He soon discovered, however, that he had gotten into the area too late to really take advantage of it, and so turned his sights to other frontiers, namely far West Chelsea. 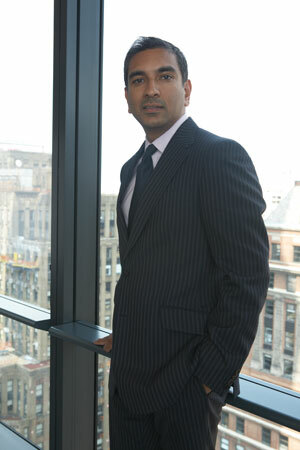 "My focus has always been emerging markets," said Naman. "I saw West Chelsea as a natural outgrowth of the Meatpacking District." The neighborhood had other promising features as well: It was basically a blank canvas with an appealing dollar-to-square-foot ratio. The opening of Chelsea Piers Sports & Entertainment Complex in 1995 brought new life to the area's waterfront, and the first of the art galleries were still rolling in, laying the groundwork for what has become the city's premier gallery district. Naman said he has dreamed of developing a ground-up project ever since moving to New York, but it took years of real estate trading to build the capital and equity required to do something at the high level of design to which he aspired. As it turned out, being unattached to a large, well-moneyed entity is part of Naman's strength. "When you do something in a larger partnership, the ideas get watered down," he said. "Everybody has good intentions, but the goal is really just making money." In contrast to this way of doing business, at 100 Eleventh and HL23, Naman has followed the philosophy of creating the best quality architecture in the hope of attracting the unique buyer capable of paying for it. Developing these relatively small projects intended for the upper echelons of homeowners has also left Naman comfortable in a generally sagging market, as the kind of customers he serves are less affected by economic downturns. As well as being savvy in the ways of wheeling and dealing, Naman seems to truly care about maintaining a certain character in West Chelsea—perhaps the quality that marks him most as a maverick among developers. "I've watched how Soho has lost its spirit. I think Soho was great. Now it's just a retail wasteland," he said. He is determined not to see this happen around the High Line. For example, he held off purchasing the property on which HL23 will rise for years because it was a beer wholesaler and provided cheap beer for the neighborhood. "If you buy 60 acres of woodland, you can either clear cut the property and start all over again, or you can try to carefully design within this incredible wooded area," said Naman. "At the end of the day, as a developer, you have to be an arbiter of good taste, and that's very personal. To make money is great, but you can do that as an investor." Today is Ray Gastil’s last day at work. On August 25th, Gastil, director of the New York City Department of City Planning’s Manhattan office, will travel across the country to take a job as Seattle’s Planning Director, marking a return to his hometown. The department has yet to name a replacement for the position. During his tenure, which began in 2005 when he succeeded Vishaan Chakrabarti, Gastil shepherded through the land use process some of the largest projects in the city’s history. He presided over the rezoning of the Upper West Side, which provided contextual protections against out of character development and provided incentives for new and affordable housing along Broadway. He also worked on rezoning to preserve the character of the Far West Village that was done in concert with historic district designation by the Landmarks Preservation Commission, as well as a major contextual overhaul of the Lower East Side, still in process. But not all of his projects were targeted at preserving a neighborhood’s character. Gastil oversaw the controversial 125th Street rezoning, adopted in April, which, while it fosters economic and cultural development along the corridor, many in the community feared would only increase displacement and gentrification in greater Harlem. Though the notoriously press-shy Gastil would not comment on his work at the department or his decision to accept the job in Seattle, his boss, City Planning Commissioner Amanda Burden, had some nice things to say. Before working for the city, Gastil was the founding director of the Van Alen Institute: Projects in Public Architecture. He participated on the Memorial Center Advisory Committee for the World Trade Center site, and served as juror and adviser to a number of major urban projects. He also directed the regional and transit-oriented design programs for the Regional Plan Association, and taught urban design seminars and studios at Pratt Institute and University of Pennsylvania. Gastil received his master of architecture degree from Princeton University, and is the author of Beyond the Edge: New York's New Waterfront (Princeton Architectural Press 2002). 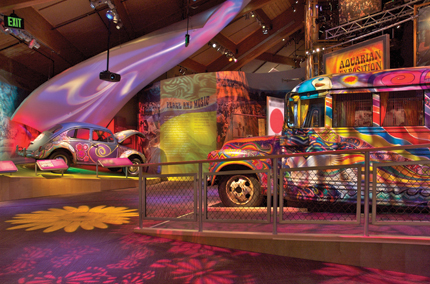 A day-glo homage to the Merry Pranksters' bus lies within Bethel Woods Center's staid exterior. How do we go back when we don’t even know where to begin? The music and drugs have been well documented, but the sense of space, the softened corners, amorphous shapes, and communal élan of the 60s counterculture are less easily reclaimed. Where are the landmarks and monuments of the psychedelic revolution? Timothy Leary spoke of a Magic Theater and the Beatles sang of Strawberry Fields. Carlos Castaneda, in his 1968 best-seller Teachings of Don Juan, wrote of the sitio, a place of psychic strength. I start by attending a press preview for the new Woodstock museum in Bethel, New York. My route is across the Delaware River and up through lovely rolling farmland, still bucolic, almost no development, with the sun sparkling on Lake Superior. The road winds through a pine forest with a mossy green glow and magic trees bending down. I can almost see the Caterpillar smoking his hookah, but not quite, and when I arrive at the new Bethel Woods Center for the Arts, the TV vans and press busses are already lined up in the parking lot. 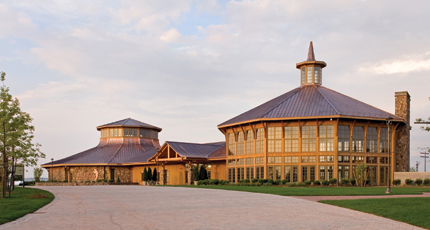 The main complex stands atop the hill, oddly postmodern, built with local stones, hefty timbers, and copper roofs rising toward glass-sided cupolas. The complex was designed by Paul E. Westlake, Jr., principal partner of Cleveland-based Westlake Reed Leskosky (co-architects with Coop Himmelb(l)au of the Akron Art Museum), and seems more like a Republican golf club than a hippie hallucination. Richard Meier was chosen originally, but client Alan Gerry reacted with alarm to his “flying saucer” proposal and in truth, Meier’s antiseptic aesthetic might have been even less appropriate for a memorial to funky mud sliding. (It’s tempting to imagine what anarchic hippie designer/builders like Steve Baer or Lloyd Kahn might have concocted given the right stimulants: a revolving kaleidoscope? Geodome? Giant bird’s nest? Freeform rabbit hole?) But while the exterior architecture seems oddly out of sync, the exhibitions inside are worth the trip, as it were. Richard Meier's original "flying saucer" proposal was rejected as too alarming for the nostalgia-soaked site. Cleveland-based architects Westlake Reed Leskosky designed the oddly postmodern complex, which was built with local stones. The centerpiece of the exhibition is a 50-foot-high surround-sound immersion chamber that recreates the spatial/aural experiences of the festival, with thunder cracking overhead and roadies scurrying across the stage. Six video projectors play on four different screens and give a pretty good sense of actually being there, but even better is the hi-def video that ends the exhibition. Shown in a little amphitheater, it tells the story through the voices of the performers themselves. You can see how musicians like Santana, Hendrix, Joplin, et al. were inspired and felt at one with the half-million throng, motivated not by profit or fame (in this instance), but by the idea of something bigger and better than their careers, singing and playing from the heart. Everyone in the amphitheater, even the gnarly New York press, seems moved and teary-eyed after the 20-minute film ends. That’s the real thing, and something makes us want to stay and watch again. Maybe it’s because the performances seem so authentic and pre-digital now. Or is it that we all want to share an idealized moment in our collective past, a never-never land of possibility and lost innocence? We need a dreamy, utopian Woodstock, even if it didn’t really happen that way. The stout, 1940s brick building at 133-139 MacDougal Street in the West Village has had a long and checkered past that has only gotten more complicated in recent months. Once the fabled home of the Provincetown Playhouse, where Eugene O’Neill launched his playwrighting career, the New York University-owned building is currently a grad student dorm. Against the steady drumbeat of preservationists’ opposition, the university has tried at various times over the past few years to tear down the historic, but not landmarked, building. And in May, the university announced that while it would save the shell of the Playhouse, it was going to replace the rest of the building with a research center for the law school designed by Morris Adjmi. The Greenwich Village Society for Historic Preservation (GVSHP) is still opposed to the plan, stating that although the structure—originally four row houses dating to the 1830s—has been altered beyond recognition (even the Playhouse entrance was moved at some point from the north to the south facade), it still beats at the heart of what was once1920s bohemian New York, having housed such illustrious tenants as the Liberal Club, the Washington Square Bookstore, the Heterodoxy Club, and Polly's Restaurant. “History doesn’t end at these four walls of this theater. This is the site where modern America was born,” said Andrew Berman, executive director of the GVSHP, at a rally outside the theater on May 27. Berman said he also worries about the "shell" the school has promised to preserve, as a similar deal was struck to save pieces Edgar Allen Poe's former home on Third Street, around which yet another law school building was to be constructed. Part of its facade was to be incorporated into the new building, but it was damaged and had to be reconstructed from scratch. NYU argues that by replacing student housing with research facilities, they are in accordance with this goal, placing their most important facilities in the core and moving housing to a more remote location. To sweeten the deal, NYU is also leaving developable FAR on the table, something school officials say has never been done before. The whole plan leaves locals nervous about the pressures such deals put on the fragile ecology of the village. A decade ago, LEED was nothing more than a misspelling for a heavy metal; today, it is the unmistakable leader in green rating systems. In the span of eight short years, demand for LEED certification has skyrocketed and the U.S. Green Building Council can barely keep up. The USGBC predicts that more than 10,000 projects covering 3.5 million square-feet had already been LEED certified as of the start of the month, with dozens more signing up every day. To help address this demand and other issues facing the program, the USGBC spent the last two years developing LEED 2009, a major reorganization that seeks to streamline and standardize the rating system to a more adaptable, accessible model. On May 20, the USGBC released LEED 2009 to the greater green public, seeking comment on the improvements to be made. 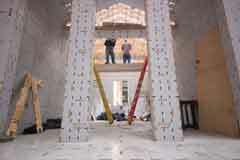 The most prominent change to the system is the weighting of the points that govern a project’s certification level. A favorite example at the USGBC is the bike rack and the solar panel. Whereas in the past, each might have received one—seemingly though far from arbitrary—point, under the new system, each is weighted empirically for its innovation and impact. In this case, the panel becomes worth considerably more. The system also puts greater emphasis on addressing specific problems rather than seeking specific solutions. Instead of pushing technologies that reduce carbon, for example, carbon reduction becomes the goal, and it is up to the designers to reach it. This new approach also allows the USGBC to put greater emphasis on certain goals, such as carbon reduction over air quality or vice versa, as the community and environment demand. To address specific regional concerns, bonus points have also been added to satisfy the various issues facing different areas of the country. Though no decisions have yet been made—the USGBC is still consulting with local chapters—the idea is that the Southwest could focus on water conservation while the Southeast would be more concerned with hurricane protection. In the past, the entire credit system was revamped, though that meant relatively few changes compared to now because of all the new programs that have sprung up. With ever-growing demand for more specific programs—LEED for airports, LEED for arenas, LEED for aquariums—a central bank of shared points has been created with complementary ratings for specific sectors. To further this accessibility, the system will also be updated on a regular schedule, not unlike many local building codes. The exact details remain fluid because the USGBC wants to hear what professionals think. The current comment period closes on June 22, at which point USGBC will consider the suggestions, revising the system accordingly, then releasing it again for comment from July though August. A final vote on the changes will come in late October or early November. LEED 2009 will then be incorporated into a larger LEED Version 3, which includes improved online filing and changes to the certification process, which are still being determined. Noho's cast-iron cachet has drawn contextual new construction. 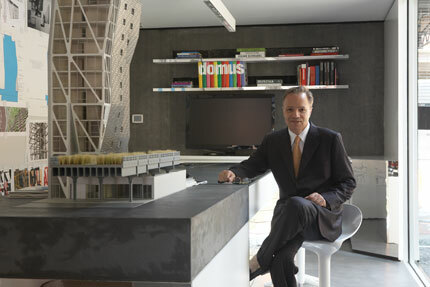 At far left, 40 Bond by Herzog & de Meuron. At center, 48 Bond by Deborah Berke. Manhattan’s all-but-vanished industrial history was front and center yesterday when the Landmarks Preservation Commission considered two former manufacturing neighborhoods for landmark designation. 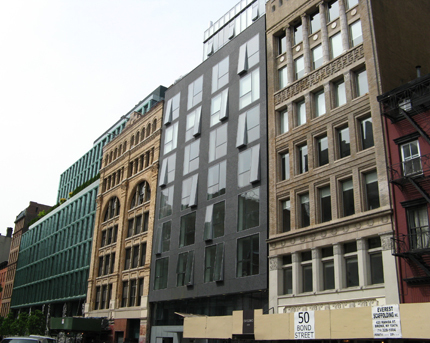 Though they share a soot-stained past, the two neighborhoods in question—Noho and West Chelsea—fared quite differently at the commission, due largely to their wildly divergent architectural trajectories in the last few years. Much of Noho, of course, is already a historic district, which was designated in 2000 and expanded in 2003. Today’s action sought to further enlarge the district to fill a gap [.PDF] between East 4th Street, the Bowery, Great Jones Alley, and Lafayette Street. The commission voted unanimously to approve the designation, following a public hearing on March 18. It was a different story for West Chelsea, which had its first-ever hearing before the commission, with preservationists facing off against developers and their representatives, who turned out to question the historical value of the area under consideration. The proposed district covers [.PDF] 30 buildings between West 28th Street and West 25th Street, and between the West Side Highway and Tenth Avenue. At the heart of the district is the individually landmarked Starrett Lehigh Building. This tale of two landmark designations hinges on local development trends. One need look no further than Bond Street and the High Line to see how. In Noho, at 25, 40, and 48 Bond Street, three marquee architects have all built high-profile luxury condo projects, all of which are surprisingly contextual considering that they did not have to go before the commission. Chalk it up to Noho’s tighter zoning rules. But also credit the cachet of the surrounding cast-iron architecture, which a number of projects in the area embrace not only in their designs but also in their marketing. While landmark status for the area might have blunted these buildings, it would not have been by much. Chelsea, on the other hand, has seen a flood of disparate, often dynamic new projects, many of which could be called landmarks in their own right—think Jean Nouvel, Annabelle Selldorf, Neil Denari, Shigeru Ban, and Polshek Partnership, to name but a few. The announcement of the High Line park and a rezoning that followed it led to this burst of development, and preservationists have so far framed the proposed district as a corrective. While the majority of this development has taken place to the south and east of the proposed district, the developers and their representatives who spoke before the commission argued that to landmark the area might put a cap on its architectural renaissance. This, they said, is because the area lacked the cohesion and historic value of a more unified neighborhood. A neighborhood like, say, Noho. Though Jean Nouvel will not receive his Pritzker until June 2, he can get a big head start on the celebrations, knowing that his Tour de Verre, né the MoMA Tower, received the necessary approval from the Landmarks Preservation Commission today for a transfer of air rights from two landmarks down the block, the University Club and St. Thomas Church. The project’s neighbors criticized it on a number of fronts at a hearing last month, and while some commissioners acknowledged those issues, the regulatory authority had little jurisdiction to tamper with Nouvel’s design. The land on which the tower will rise is not part of a historic district, so the commission has no authority over what gets built there. But because the developer, Hines, is seeking a transfer of air rights from two nearby landmarks to achieve its monumental 74 stories, the commission must determine two things in a report to the City Planning Commission, which will address urban planning issues during the standard land-use review process. First, the air rights transfer must warrant a distinct preservation purpose, including the creation of a maintenance trust fund. And second, the new building must relate harmoniously to the landmarks. The commission voted unanimously in favor of the transfer of 275,000 square feet from the church and 136,000 square feet from the club, though one modification was made to the preservation plans of the latter. Mark Silberman, counsel to the commission, opened today’s discussion of the project by affirming the narrow jurisdiction of the commission on this project and cautioned against taking some of the community’s urbanistic concerns into consideration when they had no bearing on issues of preservation. He also countered one of the critics’ biggest gripes about the transfer: the well-heeled organizations involved in the sale don’t need special treatment because their landmarks are already well tended. The commissioners seemed to agree with this logic, and chair Robert Tierney even said so before he cast his vote. The only substantive issue came from Commissioner Stephen Byrns, who said he had spent a great deal of time studying the work of McKim, Mead & White, the firm behind the University Club. Byrns felt that a balustrade once fronting on Fifth Avenue that had been lost when the street was widened would go a long way to restoring its historic character if replaced. “That balustrade would warm the heart of Charles McKim,” Byrns said. All eight of his peers agreed, and the resolution was amended to include the balustrade as part of the preservation effort at the club. “This is not over,” Veronika Conant, president of the 54th-55th Street Block Association, declared as she left the commission. In other news from the commission, a landmark district was considered for West Chelsea, an extension of Noho district was passed (more on those shortly), and Winka Dubbeldam of Archi-Tectonics was on hand to present plans for a far-out, rear-yard addition to a townhouse on West 24th Street. She said the sloping, sinuous facade will be home to a fashion-designer friend and fabricated in three massive pieces by an automotive design shop. Many architects speak of yearlong backlogs and having to turn down projects. Still, a number of sobering reports were released in recent weeks that show that trend may not continue. Chief among these was the AIA Architecture Billings Index. The index is based on a monthly survey of over 100 firms and measures their current billings record. In February, it recorded its second lowest reading, 41.3, since its inception in 1995. It was also the steepest two-month decline, at 13.2 percentage points. Numbers above 50 represent an increase in billings, and below, a decrease. For the past four years, the index has been on average five points ahead, indicating the robust construction market. The last time it showed a prolonged decline was in 2001, in line with the collapsing tech bubble that culminated in October of that year, when the index recorded its slowest month ever at 40.1. Baker said the situation is not as dire as the last recession because there is much less spec building. “You don’t have these tech companies building with 20, 30, 50 percent excess space for projected expansion,” he said. Baker also said that the nature of the downturn, which is concentrated in the housing market, is of less concern to AIA members; 85 percent of their work is non-residential, and that tends to be at the more stable high-end. The recent crisis in the financial markets could have a greater impact, but Baker said the work will then shift to governments and institutions, which like to build when markets are down and prices are cheaper. “Thank god we’re global,” Asymptote principal Hani Rashid said. “We made sure—or were fortunate—to find different clients in different economies to buffer us against what’s happening now.” Baker countered that only a small percentage of US firms work abroad, but said that this may provide an opportunity to reduce outsourcing of backend work like construction documents. 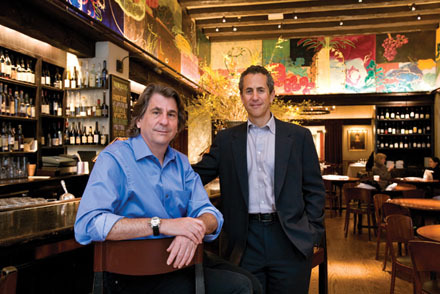 David Rockwell and Danny Meyer at Gramercy Tavern, March 27, 2008. AN: We’ve been thinking about restaurants and their role as public spaces, and the way they interact with and influence the life of a neighborhood. In different ways, both of you have worked to expand that role. Danny, this neighborhood has changed a lot [20th and Broadway] in the last 15 years, and must have seemed on the fringe when you decided to open. What brought you here? DR: How much of that was a conscious process? DM: When I realized I’d dumbed into making it work at Union Square, I thought, ‘Well, this can work anywhere,’ and started looking for dying industries. In 1985, I walked around the Meatpacking District and thought it was one of the world’s great stage sets. Later on, it hit with a combustibility that made it completely unattractive for me. DR: Now you’ll have to wait for its revival in 50 years! It’s like South Beach without the beach. DM: It doesn’t have a natural balance of residences and businesses; it’s still a stage set. If you’re the kind of chef who likes Las Vegas, this is where you would do it in New York. DR: Thinking back 15 years to when we designed Nobu, Tribeca had a lot of the characteristics you’re describing, like great architecture, but it also had residential pockets. I think part of the appeal for people going to restaurants is the exotic journey to a place where they didn’t live, the notion of a destination. The Meatpacking District is by-and-large design boutiques and restaurants, as opposed to being embedded in a fabric that’s kind of growing around it. DM: I always felt that if the balance tipped either way too much, it would be less appealing. Why? Because I wanted to be busy at lunch and dinner. Midtown was never interesting to me because it was all business, and the Upper West Side, because it was all residential. DR: There is also something about authenticity, in being the quintessential embodiment of the neighborhood. Think of the Theater District: I’m a huge theatergoer, and after all these years, I still go to Orso’s on 46th Street because it feels like an integrated part of the community. As a designer, that’s fascinating to me. Design has become a bigger discussion point in restaurants—which it wasn’t when we started 22 years ago—and what has become clear to me is that there has to be a leader—a restaurateur or a chef who has a vision that the design can relate to. If not, it becomes sort of an alien object. I was going to Union Square Cafe long before I knew Danny, and what I admired about it most is that you couldn’t put your finger on the single ingredient that made it work. That’s what we strive for in design: to have the design embedded in the concept of the owner and the operator in a way that it provides a back story; then design decisions aren’t arbitrary. DM: The neighborhood is the frame that provides the context, and the restaurant has to belong in that frame. I wanted to pick neighborhoods that I felt comfortable in. One of the reasons you don’t see me in Las Vegas (so far) or you wouldn’t see me in the Meatpacking District, is that it’s not who I am. DR: Another week, you never know! DM: But it’s not going to ring true. I always thought that, like Union Square, I’m weird, but not too weird, and normal, but not too normal. DR: You know it’s interesting you mentioned Vegas, which is nothing like this city. Just take the circulation in Vegas, for example, where it’s a one-way corral—there’s a way in, there’s a way out, and you’re largely directed like cattle. I think most people who look at restaurant design don’t understand that the biggest decisions really aren’t what things look like. The biggest decisions are about choreography, circulation, scale, a series of views that unfold, the ability to get the food to the tables, how the first 15 people feel—all of the basic decisions that break down the scale of the room. And all of those decisions have to be driven by a relationship with the restaurateur or chef. AN: Those are all urban design issues, too. DM: I think a good designer is like a really good shrink. The information is there, you just don’t know how to pull it out of your subconscious. This is what I’ve loved about the relationships I’ve had with architects. It was dumb luck that I met Larry Bogdanow, who designed Union Square Cafe. I didn’t know the first thing about architecture. I told him I wanted a place that looks like an architect was never in there, and that you’d never know it had been designed in 1985. But what I learned was that all these small episodes that happened because of that architecture are what people wanted. Here at Gramercy Tavern, I wanted to create episodes so that, as a diner, wherever you are, you’re in your own neighborhood. Another neat thing happened—David probably figured this out 30 years ago, but I hadn’t—when you create more small communities within the restaurant, you multiply the number of corner tables! DR: Another fascinating thing is the collaboration that goes on in a restaurant. It’s a social place in which you are eating food that is handmade for you, so you have the ability to make links between all of these things and the texture of a place. I think more than ever, since we’re in this world of sameness and can replicate a design through CNC milling a million times, that the notion of craftsmanship and sense being touched by the human hand is increasingly important. AN: We wanted to ask you both about private programming in public spaces, in particular the controversy over replacing the restaurant in the old bathhouse in Union Square. On the one hand, there’s been a seasonal restaurant there, Luna Park, for years, but many argue that it amounts to a privatization of public space. DM: It’s a fascinating issue for me. Any question that begins with ‘What does the community want?’ always leads me to wonder, ‘Well, who is the community?’ Whether or not you ever went to Luna Park or ever believed it should have been put smack dab in the middle of Union Square, there were lines of people trying to get in every single night. There was clearly a community of people who loved having a place to go. To some degree, it made others feel safe because there were people in the park. These are people who may not go to community board meetings or get politically active. Then there are also preservationists, and people who think there shouldn’t be any money exchanged in a public space unless it’s for the public good. It’s kind of like religion—no one religion can be all right unless the rest are all wrong. All these constituencies need to be balanced: There is a playground constituency, a Greenmarket constituency, a food constituency, a dog-run constituency… I’m very comfortable, for example, with the model we have at Shake Shack, where we have a partnership with Madison Square Park Conservancy so that we can return money to that park. DR: The opportunities for architects to work with public/private partnerships to create interesting new opportunities is going to grow exponentially—with tighter budgets, there’s just less and less public money. We’ve been thinking for three or four years about playgrounds, and wanted to establish a pro bono, not-for-profit group in New York. I realized early on that we had to build in parents as a constituency—the people who use playgrounds had to be comfortable with it. And so when we were making our presentation—it had to be approved by the Landmarks Preservation Commission, the Seaport, and Community Board 1—it was hard for them to understand at first that there was no reason for us to do this other than to contribute, and we volunteered to raise money to endow the organization. That’s when the light bulb went off for them. Now we’re approached by every community in New York that wants a playground. They’re all private groups for public places. DM: People are okay with playgrounds because you don’t have to pay to use them. DR: But the link that I’m making is about the programming of public spaces. And one of the things that we haven’t touched on, Danny, though it is an interesting point, is to look at the city inside-out. Look at the role of restaurants, and by extension hotel lobbies—New York’s inner spaces. During the 1920s, which was the golden age of hotels in this country, lobbies were an extension of the public realm; they’re private spaces but opened to the public. The city looks so neat and organized from the air, and then when you get down to the ground, it’s much messier and it’s much more vital—that’s what is fascinating. DM: I moved to New York for good because I had fallen in love with the Algonquin lobby. DR: I moved to New York because when I was 11, we came into the city, went to lunch, and then went to the theater to see Fiddler on the Roof. And with both of those city experiences, a kind of light bulb went off and I knew that this is where I wanted to be. I got a sense of the relationship between communal spaces and storytelling, and it was a real eye-opening experience for me, to see the relationship between audience and performer. DM: Well, that’s New York. In fact, it’s the dialogue between whoever is performing and whoever is the audience, everywhere. Those were my first experiences, too—it could have been theater, it could have been jazz, it could have been in a restaurant. There’s always someone who has something to say and someone who’s there listening. That’s what the whole city is about.